Sit down and rise up safely from the toilet using the toilet safety rail handles for balance and leverage. Soft padded armrests (handles) provide a firm non-slip grip providing you with additional confidence. 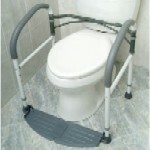 The toilet frame is width adjustable from 16 to 18 inches wide. Using push pins (buttons) and corresponding holes for different widths, the adjustable width allows to you fit the toilet frame to the perfect width for your comfort and better leverage. The toilet frame attaches securely to your toilet. Your weight adds additional stability. Available in while with dark (resists soiling) soft, padded armrests/handles. 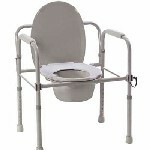 Folding Steel Commode that folds for travel or storage. 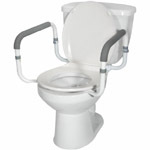 Conventional bedside commodes don't offer this flexible advantage. Durable, sturdy and safe powder coated steel body.